Edinburgh City boss James McDonaugh knows his side are in last-chance saloon territory. 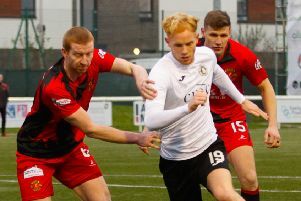 Having slipped five points behind Peterhead in this season’s Ladbrokes League Two title race, defeat at Annan Athletic last weekend coupled with the Balmoor outift’s trip to struggling Berwick on Tuesday night looked set to extend that gap even further. However, first-half goals from Lewis Barr and Cameron Blues earned the Borderers the points that has not only boosted their own survival chances but has also given the Citizens renewed hope they can earn promotion to Scottish football’s third tier as champions. The Blue Toon are the visitors to Ainslie Park tomorrow in what is expected to be a high-octane first versus second clash. City are undefeated against Jim McInally’s side so far this season with a win and two draws. And, with the lower leagues firmly in the spotlight due to Scotland’s involvement in Euro 2020 qualification against Kazakhstan and San Marino, the focus is very much on north Edinburgh this weekend. “It has to be our biggest game of the season. It’s certainly one we cannot afford to lose as they would have to lose three more games than us in the run-in which I just can’t see,” McDonaugh explained. “If we draw there would still be a five-point gap and they’ve still got to play Clyde so we’d still be in the hunt. Asked if his frustrations from the defeat at Annan ran deeper as a result of the outcome from Shielfield Park earlier in the week, the former Falkirk assistant said: “Berwick have themselves to look after with them fighting it out at the bottom of the division so it’s a big result for them. They showed a lot of good things when they played us recently and we’ve still got to go down there next weekend so that will be a tough one, make no mistake about it. “What it has done is given us a small glimmer of hope but, at the same time, we’re kicking ourselves after losing to Annan on Saturday. I think if we’ve got any last chance then we’ve probably got to win tomorrow. “I’ve not been pessimistic about what we could achieve this season but winning the league, personally I’ve always felt it might be a step too far. We’ve tried to push as much as we can. “Even now it’s still in the back of your mind that with seven games to go, if we could pick up six wins then we’d finish on 79 points which would be a phenomenal total. If you don’t win the league with that tally then there’s not much else you can do about it. “We’ve just got to try and get as many points as we can and see where it takes us. Although fully focused on preparing for tomorrow’s clash, McDonaugh revealed his players were keeping tabs on what was unfolding at Berwick. “The players aren’t daft. When we were training on Tuesday we knew before we’d even started that Peterhead were losing 2-0,” he admitted. “Some of them were saying, ‘oh we’ve missed a massive opportunity’ by not winning last week but we now have to take care of ourselves tomorrow. “To have secured a play-off spot by March is great and something we could not have envisaged at the beginning of the season and I know we keep saying the same things but we need to remember the progress that has been made in such a short period of time. City do have injury concerns over captain Josh Walker and defender Liam Henderson, but McDonaugh is hopeful both will recover in time to take their place in the starting XI. And despite playing and scoring in last week’s defeat at Galabank, top goalscorer Blair Henderson never trained in the run-up to the game and had to take injections to get him through the 90 minutes.